So now that you have built a boat, you need a rack for it! If you like it, be sure to come back for more. Thanks to our customer Jay N. for creating this plan and submitting to us! So you've built a boat, where you gonna put it? We have a great selection of boat plans, but when you are finished with your boat, don't you need a place to put it? Please enjoy this nice set of free wood plans on how to build a canoe rack! Also, please make sure you check out our custom boat plans before you leave our site and see if they meet your needs as well. 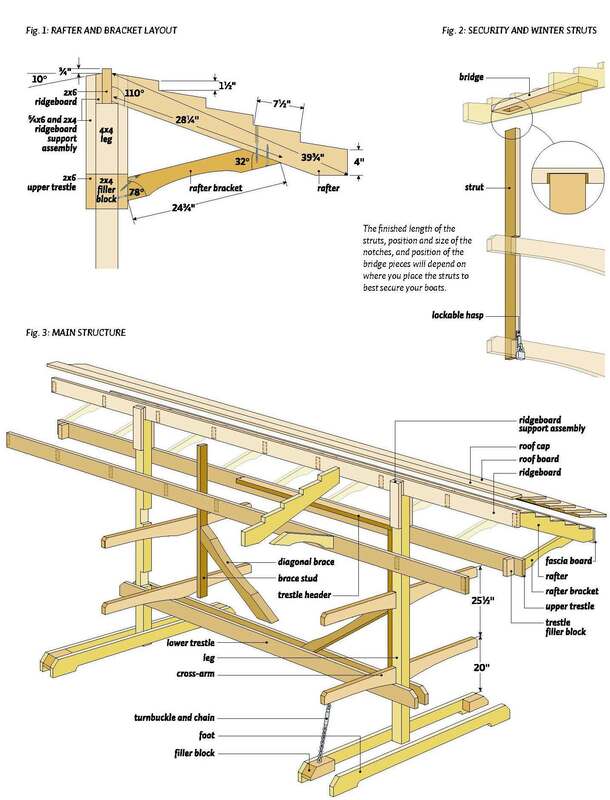 Our shed plans package has thousands of wood plans just like this, not just shed plans! We also have a great set of Jungle Gym plans for your backyard. Plenty of plans to keep you and your kids occupied. They are all available for immediate download! 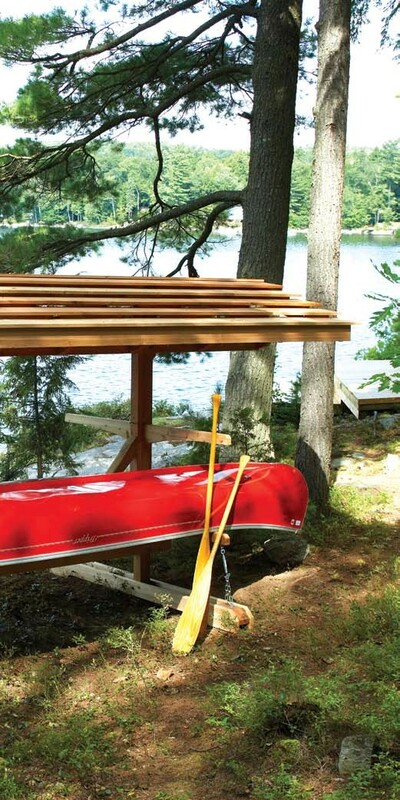 Give your canoes and kayaks some VIP treatment. Get them off the dock and into a custom storage stand. A couple of rickety old sawhorses. That’s what passes for a winter storage system for my canoe. And during canoe season, I just park it upside down on the beach. I didn’t invest a lot in that canoe—in fact, I don’t even like it much—so I don’t lose sleep over UV deterioration, or weather damage to the thwarts, or even a limb falling on it. Certainly, a better model— the kind that many cottage folks have— should be better protected. It’s the owners of those boats who have been asking us to feature a storage-system project for canoes and kayaks. The design and engineering challenges for this project were many. 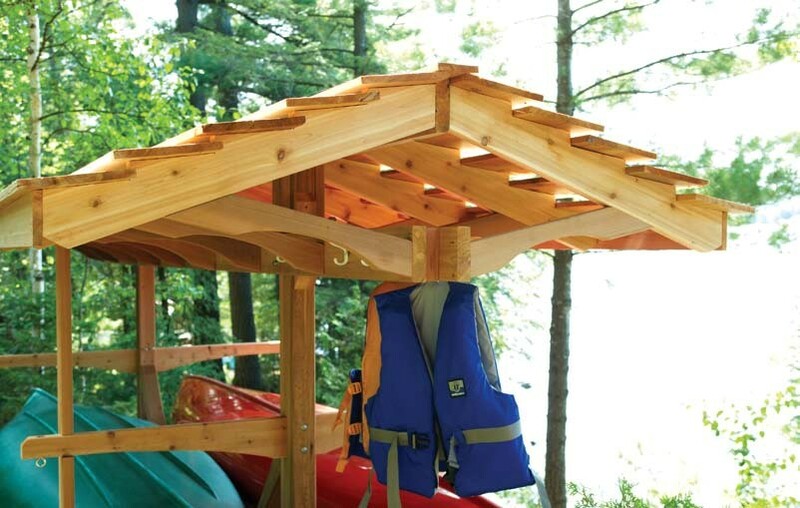 We wanted it to store four individual crafts, whether canoes, kayaks, sailboards, or even rowing shells. It should be stable on sloped cottage waterfront, as well as provide the boats a basic measure of security and a roof for some protection from sun, weather, and tree debris. Before you build, give some thought to the sizes of boats in your flotilla: You can easily modify the overall length of the rack or the position of the cross-arms to suit. Though this is not a complex project—a couple of weekends’ worth of work—you will need a part-time helper to assemble it. All wood is cedar, except the roof boards, which are pine. Substituting pressure treated lumber for cedar, where possible, will reduce the project cost significantly. 1. Chances are your rack location isn’t level, so your first step is to add extra height to the down slope leg. Mark roughly where the two legs will go. Sit a long, straight board on the ground, on edge: one end at the upper leg mark, the other in line with the lower mark. Lift the low end to level (using a level, not an eyeball). Measure from the ground to the bottom of the board at the low mark. 2. Cut the legs from the two 8'-long 4x4s —one 838" long, the other that length plus the extra height you just measured. Mark notches for the cross-arms on the short leg and transfer the layout to the long leg. The notches should be 15" deep by 55", but check your 2x6s; their dimensions can vary. To cut the notches, set your circular saw blade to cut 15" deep, then make several passes to remove most of the waste. Chisel out the rest and carefully smooth the surfaces. 3. From two 14'- ong 2x6s, cut four 7' pieces for the feet; with a jig saw, make the 15"-deep cut-outs along the bottom. Cut four 10" lengths of 4x4 for the filler blocks (two from the leg off-cuts, two from the 10'-long 4x4). Drill a 5⁄16" hole through the middle of each filler block for an eyebolt. Screw the feet to the filler blocks with #10 x 35" screws and mitre the top corners. In each filler block, install an eyebolt and a nut (with a washer on each side of the wood) and tighten. Slide each leg into the middle of each foot assembly and clamp in place. Drill a 4" hole through the foot assembly and the leg. Insert an 8" carriage bolt, add a washer and nut, and hand tighten. 1. From the two pieces of 12'-long 2x6, cut four 6' cross-arms. Each cross-arm has a curved bottom taper—a detail that makes them look lighter and more elegant. To mark smooth curves, all you need is a thin, flexible strip of wood (a fishing rod works too). Mark where you want the taper to begin and end (leave the outside ends 35" wide). Holding the strip against those marks, bend it to form a smooth curve. If you don’t have a helper, a few finishing nails will hold the strip in place while you mark. Cut and sand the tapers and trim the top corners. 2. For the eyebolts in the cross-arms, you’ll need to drill clearance holes, plus a countersink for the nut. Drill a 1"-dia. hole 5" deep in the ends of each cross arm and a 5⁄16" hole all the way through. I had to cut about 5" off each eyebolt so it wouldn’t protrude and scratch boats. If you put a nut on the bolt before cutting, unscrewing the nut will fix any threads that were damaged by your hacksaw. 3. Square the cross-arms in the leg notches and clamp in place. Drill two 4" holes in each; install 4" x 4" galvanized carriage bolts, washers, and nuts. 4. Miter the upper corners of the two 10'‑long 2x6s for the lower trestle frame. A bit of juggling follows. You and a helper must stand each leg assembly (eyeballing that the leg is plumb) with the bolt heads facing out, and clamp on one of the lower trestle pieces. It must be tight to the lower cross-arms and extend 6" beyond each leg. It will be close to level because you already compensated for the longer down slope leg, but minor shimming or excavating may be needed to get it perfect. Plumb the legs and screw on temporary braces. Screw the lower trestle piece in place (positioning screws where they won’t interfere with the bolts) so you can remove the clamps. Add the other lower trestle piece and bolt everything together with two 4" x 8" carriage bolts per post; cut off the bolt ends and file smooth. 1. Trim three 16'-long 2x6s to 15'6" for the upper trestle pieces and the ridge board. Using two carriage bolts per leg, attach two of these pieces as in the plans, 92" below the tops of the legs. A 2x4 header strengthens the upper trestle: Cut a 10'-long 2x4 to length (about 8'5") and screw between the upper trestle pieces. Screw a 2x4 trestle filler block—55" long—between the upper trestle pieces, about 3" in from each end. 2. Mark the rafter positions on each side of the ridge board: All (except the middle rafter) are 24" on centre, starting in from each end. Note that the top edge of each rafter is 8" down from the top of the ridge board. Centre the ridge board on top of the legs and toenail in place. The ridge board needs more support than just a few nails, so I built a wood sandwich to hold it. The “buns” are 2x4s, running along the legs from the upper trestle frame to the top of the rafters. The “lettuce and tomato” are made of 5⁄4 deck board, filling the gap on either side of the ridge board. Don’t forget to match the rafter angle when you cut these pieces. Screw the sandwich in place. 1. The method I devised to give side-to-side stability to the rack is pretty darned clever! It adds rigidity to the structure and adjusts for uneven ground. Attach each turnbuckle (opened to about 8 of its total length) to the lower cross-arm eyebolt, using a 3⁄16" anchor shackle. Cut ieces of chain to the distance between each turnbuckle and the eyebolt below plus about 6". Fasten the chain to the eye with a 3⁄16" quick link and hook the turnbuckle to the chain. Check that the legs are still plumb. Tighten each turnbuckle by hand only, working each side a little at a time to balance the tension. Remove the temporary braces. 2. Cut the two 4x4 diagonal braces— 4' long with 45° cuts at each end. I used a band saw to cut decorative curves in the 4x4s, a completely optional step. From a 10'-long 2x4, cut two 55"-long brace studs. Slide them in place between the trestle frames and tap to make an impression of the cross-arm nuts. Remove the brace studs and drill 1"-dia. pockets, about 6" deep. Clamp them back in place; they should sit tight against the legs. Position the braces and mark where they meet the brace studs. Remove both pieces once more and screw the braces to the brace studs with eight #10 x 35" screws. Then screw these assemblies to the legs and lower trestle. 1. The rafters are cut from six 10' long 2x6s (three per board), while the brackets are cut from four 8'-long 2x4s (lay these out carefully or you’ll need more wood). While notching the rafters is indeed tedious, it’s not just for style: The louvered roof will reduce wind resistance. Carefully mark and cut one rafter as a template for the others (Fig 1). Mark where the rafter brackets meet the bottoms of the rafters. Mount the rafters on one side by screwing straight through the face of the ridge board; secure the other set by angling screws into them. 2. Before you start attaching the brackets drill a clearance hole in each—about 3" in from the end—to facilitate screwing to the rafters. Secure the for end brackets to the for end rafters. 3. Rip the best 1x10 roof board down the center to make two equal fascia boards. Trim to 15'6". Mark the rafter positions on the top edge of each fascia board. With your trusted assistant, attach the fascia boards to the ends of the four bracketed rafters using #8 x 2" screws; use a short straightedge to drop the fascia just enough that the roof boards will rest flush on top. Screw the remaining rafters to the fascia and the ridge board, and the rafter brackets to the rafters and the upper trestle. I drilled a clearance hole down from the top of each rafter for a second screw into the bracket. 4. Trim the 1x10 roof boards and the 1x6 roof cap to exactly 16'. Making sure the roof structure is more or less square (it’s not a house, so don’t be a perfectionist here), screw the boards on. Start with the roof cap and work out from the peak. 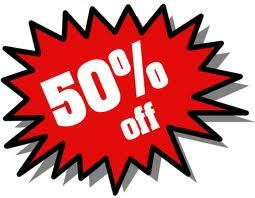 The roof structure makes up a good 40 to 50 per cent of the overall cost. 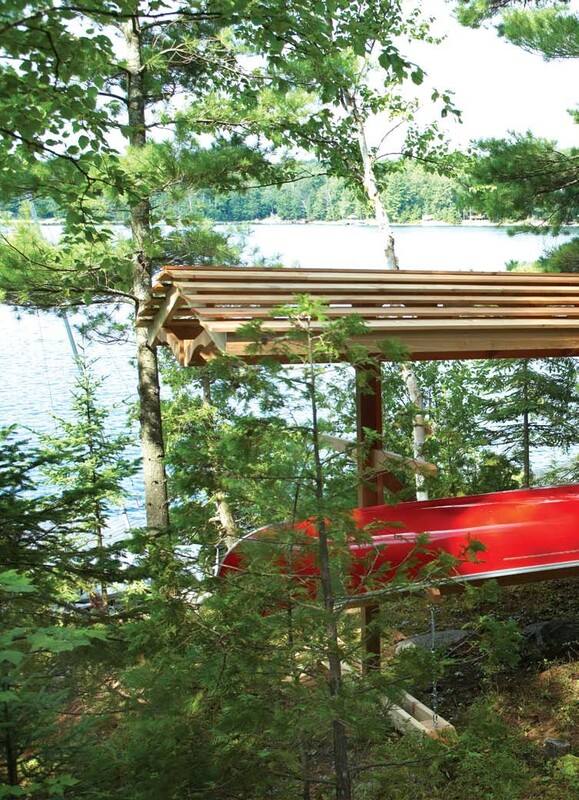 If your canoe is like mine, accustomed to neglect, you can omit the roof, but you should still include the upper trestle pieces. They’ll only need to be 10' long; lop off the top of the legs as well, since you don’t need that height for the roof. both (see fig. 2). No, it won’t stop a determined thief, but will prevent casual “borrowing” when you’re not around. 1. Cut two 10' 2x4s to make four 5'-long struts. With your boats on the rack, hold the struts against the cross-arms, close to the boat hulls. Position them so that removing your boats is impossible when the struts are in place. Hold the top end of each strut high enough that a bridge piece can secure it (see Step 2, below), and mark notches in them to mate with the cross-arms (the notches’ lengths will vary). Cut the notches 15" deep. 2. Measure and cut a 2x4 to bridge the rafters over each strut. Each bridge piece needs a pocket cut into it to hold the top end of the strut. Clamp struts to the cross-arms (plumb) and position the bridge between the rafters. Mark where the struts meet those pieces, then remove them and cut a pocket (16" by 4" by 1"deep) for the struts. I used a 16" Forstner bit, but a smaller auger bit and chisel will work; likewise, you could use a router. Screw the bridging pieces to the rafters (#10 x 35" screws). 3. Attach a lockable hasp to the cross-arm and strut as in the photo. To hold the boats to the rack, we added threaded eyes to the legs; bungee cords hooked into these and the eyes at the ends of the cross-arms stop boats from rattling around during a good nor'wester. We screwed a few hooks to the upper trestle frame to hang PFDs. You can also fashion a paddle rack to hang your favorites—and the other ones you lend to friends and relatives. Finally, stain or paint the canoe rack if you choose, but for my money, nature makes the best finish job.